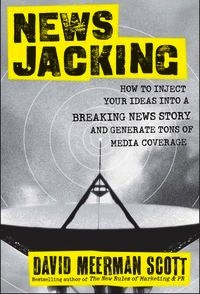 Tag Archives for " newsjacking "
My friend David Meerman Scott just released an all digital book called Newsjacking: How to Inject your Ideas into a Breaking News Story and Generate Tons of Media Coverage. The idea behind this very quick read is to involve your brand in some breaking news story using real time tools to garner some of the publicity by being a part. Here’s my take – this book is not for everyone. In fact, many people should not read it because the tactics Scott talks about require a great deal of strategy, subtlety and grace to pull off effectively. There are many pitfalls to newsjacking done wrong and I suspect many people will misuse Scott’s message and means. Scott gets how to do this like few do and he’s studied both the good and bad, but make no mistake this is both a powerful and legitimate tactic only for those who use great restraint and know how to strategize on the fly – if that’s you – you need this book.